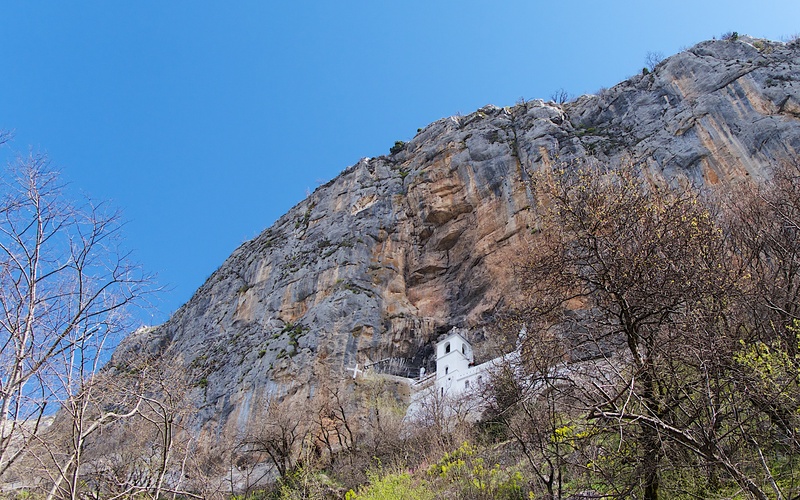 The fast road from Podgorica to the large town of Nikšić runs up the south side of the Zeta valley and gives a distant view of the Ostrog monastery, white against the high, dark cliff. The monastery is a principal place of pilgrimage within the Serbian Orthodox Church and also much visited by tourists. A smooth road from the highway twists up past a lower church, dormitory building and relentless array of souvenir and food kiosks to a car park just below the upper monastery. At the front of the building, stonemasons were laying new paving; the angle grinders made an uncomfortable, far crying din amplified by the high rock wall above. The monastery of sound. 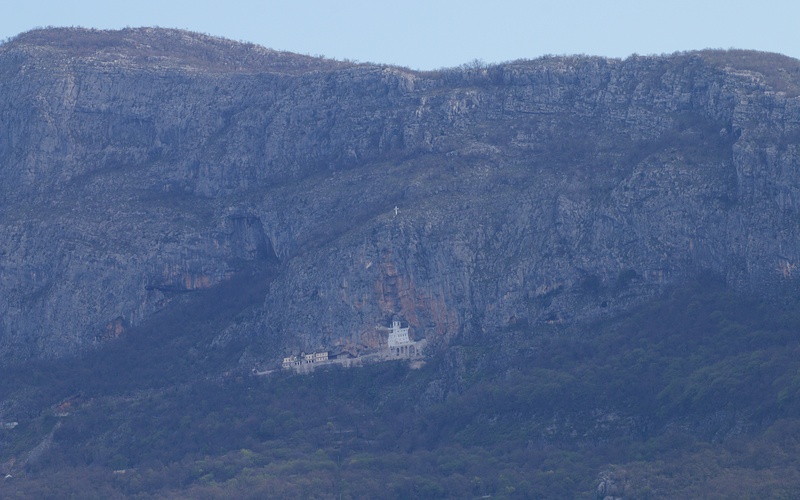 Ostrog Monastery at the base of the high cliff face of Ostroška Greda. 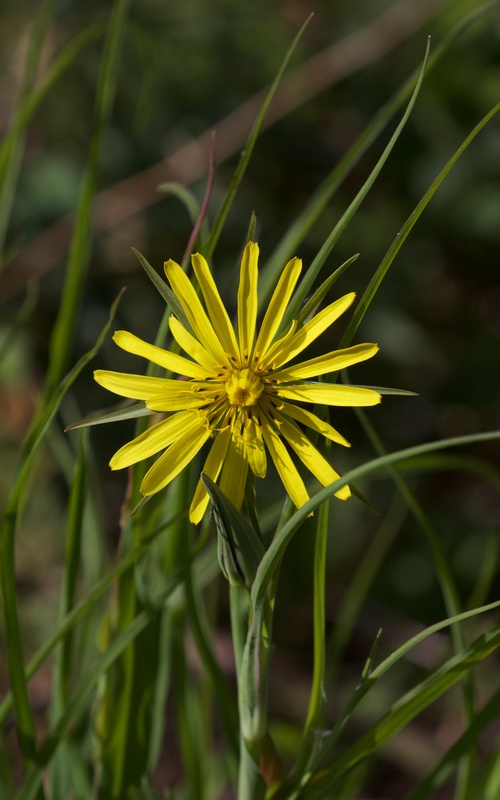 The narrow terraces below were springing into life and salsify (Tragopogon dubius) was radiant. A kestrel called from above and settled on a ledge. The pair is likely to have a nest on a narrow ledge with eggs, perhaps small young, at this time. A colony of Jackdaws were circling noisily above and swinging into their nest sites in deep crevices. Their strangled cries are good natured and always a pleasure. Nuthatch calls rung out from the oaks, rock nuthatch from the cliff and jays were unusually approachable, having learned that tourists here are, more often than not, generous. 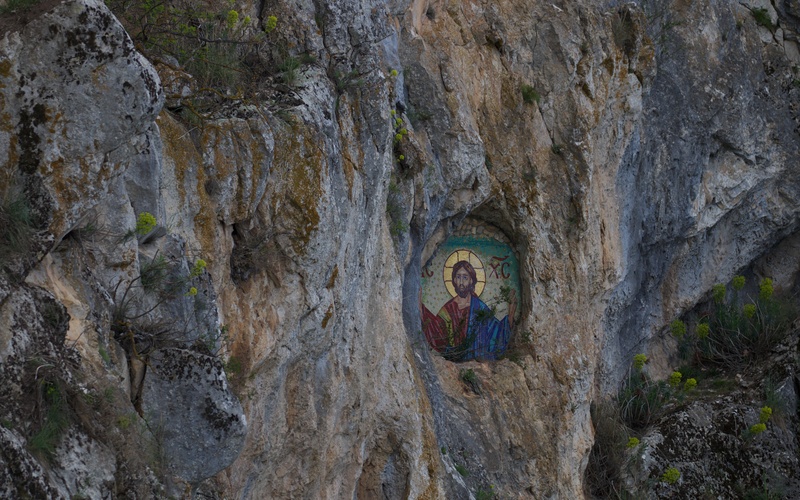 Painting on the cliff next to the upper monastery and salsify in flower. The main road runs on up bypassing Nikšić towards the smaller and remote, border town of Plužine; after 10 kilometres or so, there is a turn off up the mountainside to the tiny town of Šavnik. 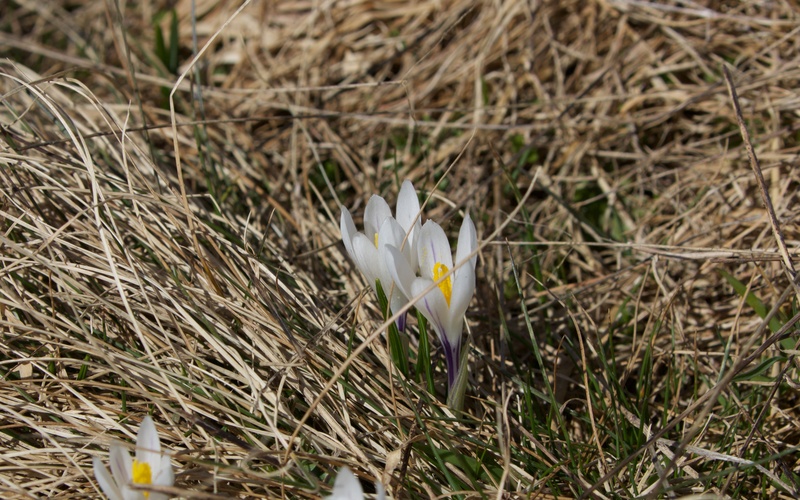 Just before the long tunnel and thence the descent to the town, tiny white Crocus vernus albiflorus along with the more typical purple C. vernus dotted the flattened and yellowed grass on the edge of the retreating snow. Plants at this altitude were few and restricted to the south facing slopes; small. fragrant hellebore (Helleborus odorus) had recently emerged as had a pretty Violet (Viola) species. 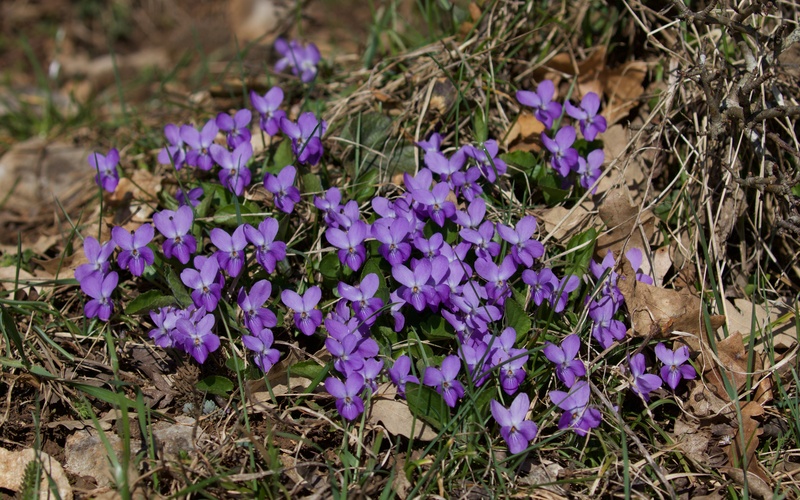 Crocus vernus albiflorus and Viola species. 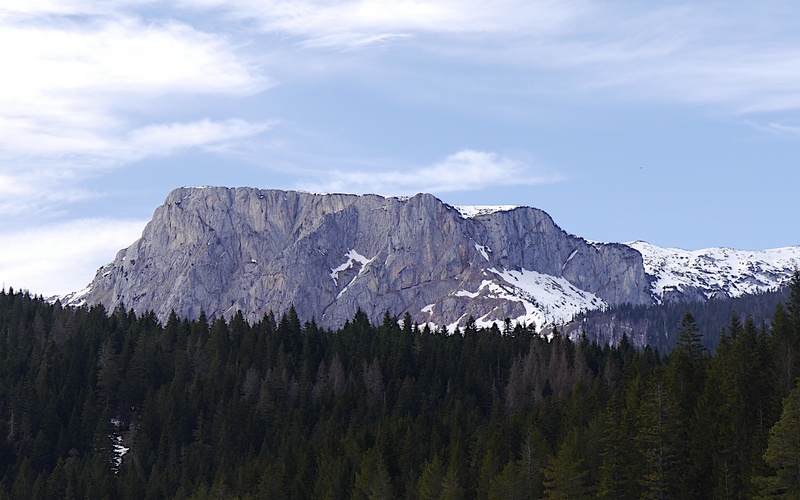 The road descended from the tunnel towards Šavnik and having twisted down the moutainside crossed a high plateau with small villages and a panorama of the Durmitor range. Just before Šavnik the road crossed a mountain torrent where grey wagtails and dippers were nesting on the bridge or the cliffs. Blackcaps worked the bare branches of trees hanging over the river and were as common here as around Lake Skadar. 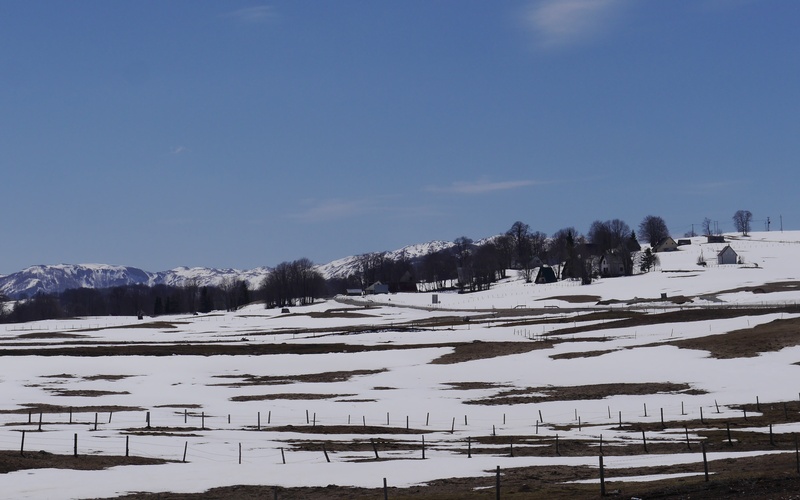 The rolling landscape either side of the road from Šavnik up to Žabljak was still largely snow covered with patches of dark ground and temporary meltwater lakes; it still felt like winter not spring. A few small farms were active with herds of thick-coated sheep. A raven flew by. The road to Šavnik and distant Durmitor range beyond. The snow still holding on by the road from Šavnik up to Žabljak. The tourist town of Žabljak had great piles of snow on the pavements where ploughs had cleared the roads. The skiers had gone and their was a welcome lull before the coaches started to arrive wit summer visitors. The road to the Crno Jezero (Black Lake) had been cleared but the scene at the frozen lake was cold and harsh; the circle of tall spruce (Picea abies) forests silent and claustrophobic. These altitudes need another month at least before life is on the winning side. 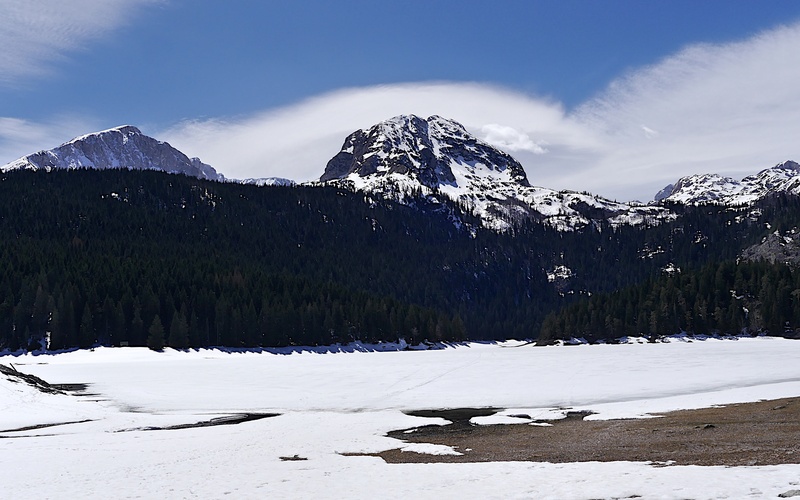 Durmitor peaks: Savin Kuk and Medjed directly above the frozen Crno Jezero. Bobotov Kuk, the highest peak, is somewhere to the right of Medjed in the cloud. The impressive, stark face of Crvena Greda to the west. 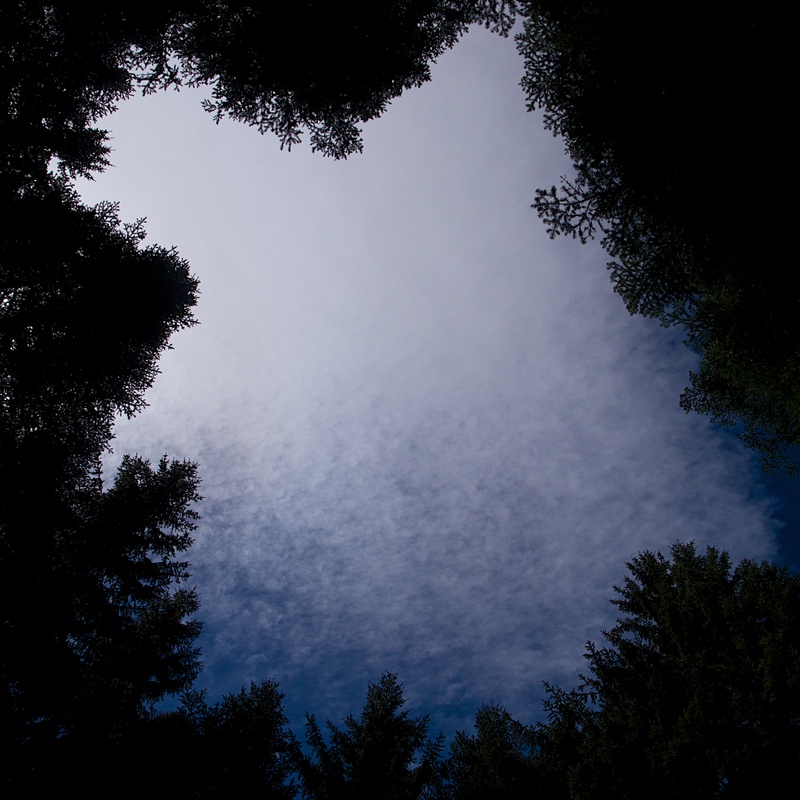 Dark Durmitor: a gap within the deep Spruce forest. Running back down the Tara Valley and on to Biogradska Gora, the evening light cast warm and welcoming colours on the tall beeches (Fagus sylvatica). Cowslips (Primula veris) were in the meadows, pink and mauve lungwort (Pulmonaria officinalis) was emerging under the trees and the single, pink broomrape (Orobanche sp.) had turned into a colony of 10 or more small spikes rising from the leaf litter. 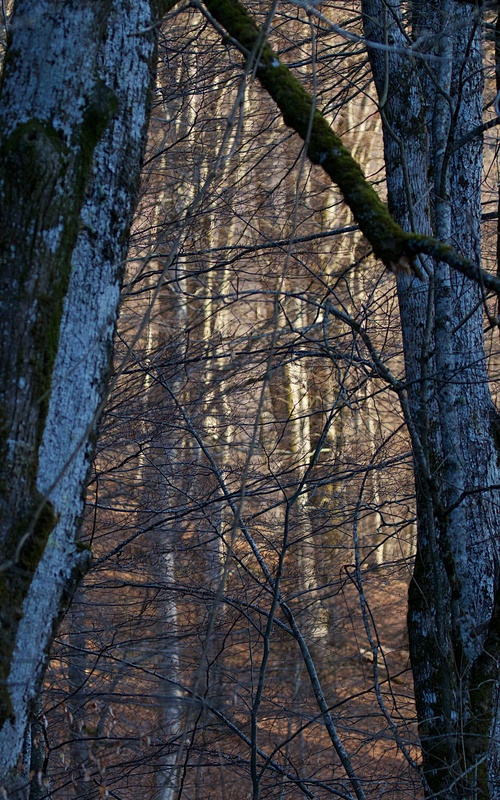 Biogradska Gora beeches in evening light. Absolutely loving this blog, thanks Steve! Thanks Robbie. Really pleased to know this.